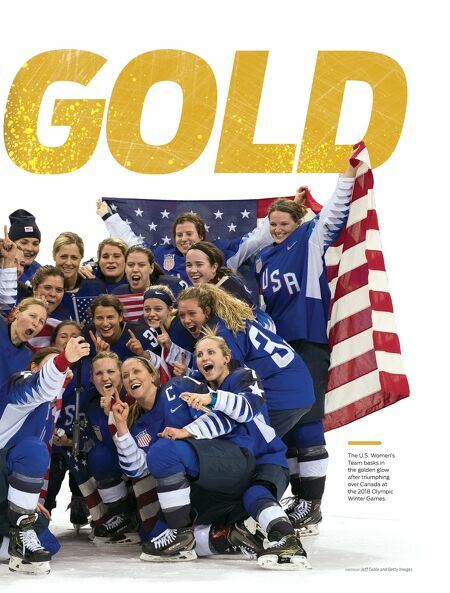 16 // MARCH 2018 USAHOCKEYMAGAZINE.COM "I looked up and saw Maddie smiling and said, 'We're good, we got this.'" Team USA Captain Meghan Duggan By Harry Thompson Twenty Years In The Making, U.S. Women Crowned Olympic Champions After Win For The Ages While Maddie Rooney and her U.S. t e a m m a t e s w e r e st i l l c e l e b r a t i n g their gold-medal victory, someone snuck onto her Wikipedia page and changed her status from Goaltender with the U.S. Women's Olympic Team to Secretary of Defense. Asked about it the next day, the 20-year-old netminder deflected the attention with the same skill she used to turn away Canadian shooters. "That's funny, but I wouldn't call myself that," said Rooney, who had yet to remove the smile from her face or the gold medal from around her neck. Her teammates quickly responded, "We would." 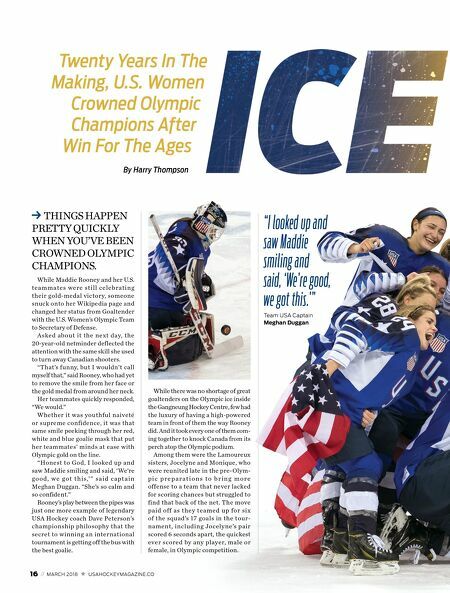 Whether it was youthful naiveté or supreme confidence, it was that same smile peeking through her red, white and blue goalie mask that put her teammates' minds at ease with Olympic gold on the line. "Honest to God, I looked up and saw Maddie smiling and said, 'We're g o o d , w e g o t t h i s ,' " s a i d c a p t a i n Meghan Duggan. "She's so calm and so confident." Rooney's play between the pipes was just one more example of legendary USA Hockey coach Dave Peterson's championship philosophy that the secret to winning an international tournament is getting off the bus with the best goalie. While there was no shortage of great goaltenders on the Olympic ice inside the Gangneung Hockey Centre, few had the luxury of having a high-powered team in front of them the way Rooney did. And it took every one of them com- ing together to knock Canada from its perch atop the Olympic podium. Among them were the Lamoureux sisters, Jocelyne and Monique, who were reunited late in the pre- Olym- p i c p r e p a r a t i o n s t o b r i n g m o r e offense to a team that never lacked for scoring chances but struggled to find that back of the net. The move paid off as they teamed up for six of the squad's 17 goals in the tour- nament, including Jocelyne's pair scored 6 seconds apart, the quickest ever scored by any player, male or female, in Olympic competition. THINGS HAPPEN PRETTY QUICKLY WHEN YOU'VE BEEN CROWNED OLYMPIC CHAMPIONS.